SMSender Has Loads of Powerful Features! We offer bulk SMS software management features that ensure a long lasting and stable service by using our SMSender Web and App. Why Are So Many Marketers Using SMSender bulk sms software? Easy to use Web Interface and matching App. Powerful tool to manage your SMS marketing. Easily works with any SMS gateway that supports HTTP API such as Nexmo & Clickatell & Twilio. 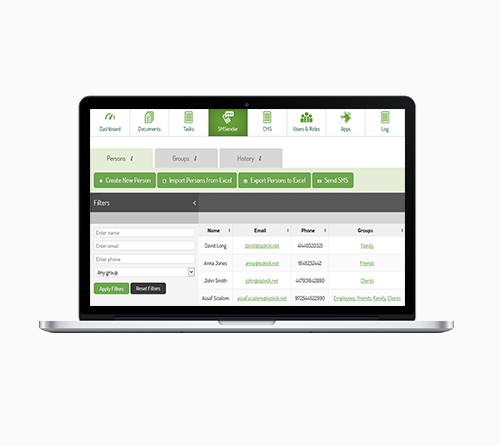 Built on iQDesk engine for easy insulation and minimal configuration. Create as many contacts as you'd like and group them into groups. You can assign multiple contacts to multiple groups easily. With an added search tool you can find the contacts and their groups fast. Insert to the system all your contacts from Excel or Export from the Web. Easily done and a great time saver tool. As a result you no longer need to keep huge excel files with your contacts. Send Mass Emails with an option to add a limit per hour on the server otherwise it will be treated as spam. Create unlimited groups and assign contacts to them. Send sms in one click for a group rather go one by one. You can create multiple accounts to use the API, so other users can have access to use the system. Easy interface to write and send sms from the web rather using your mobile phone for this. Since you can work with any SMS gateway that supports HTTP API the configuration is minimal. Predefined gateways: Nexmo, Clickatel & Twilio. Put your username and password and start sending SMS. Offering all the features including importing all your mobile phone contacts to the App. You can add a Name, Last name and personal greeting, when you customize you can increase your SMS campaign efficiency. You can add a link to your messages. By adding a link can increase the effect of your marketing. SMSender supports long messages 70 characters per SMS. You can also send longer messages that will get split into another SMS.